MRTeam was honoured to participate in Ignite The Plaza on Friday 5th October. Ignite The Plaza is a Milton/Ulladulla Rotary HarbourFeast event which was held in conjunction with the 2012 EscapeArtFest. 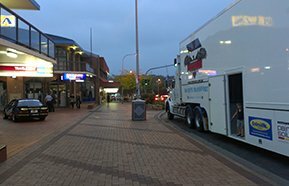 The MRTeam custom built race car transporter and one of the race cars were on display for the evening, taking prime position on the Princes Highway at the front of Ulladulla Plaza. Entertainment on the night included the lovely Sarah Date performing with Ronny Ellul, Funky Moves Dance Crew performing a hip routine, 'Spring in the MUD' Art competition winner announcements, wine tasting with Morrellis Winery, and several raffles drawn throughout the evening with the chance of winning a whole dressed lamb. Dinner was provided by the Plaza eateries. It was a fantastic night of good food, fine wine, live music and lots more great entertainment. MRTeam thoroughly enjoyed the evening and is thankful for the opportunity to be involved in the local event.